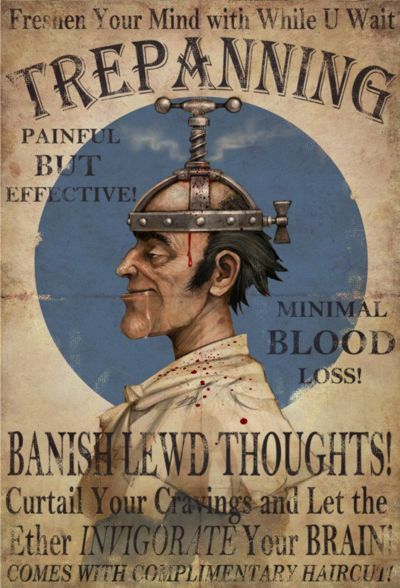 Trepanning/trepanned seems to have an interesting lineage. There are two meanings of trepanning, the first, also known as trephination, or making a burr hole, is a surgical intervention in which a hole is drilled or scraped into the human skull. This horrifying and ancient form of neurosurgery was often carried out in order to let evil spirits escape from the sufferer, or to treat a compression or swelling in the brain. The second meaning derives from trepan as an archaic verb to entice, ensnare, swindle or trap. And a noun: a trickster or a swindler.